Controversy trails behind the Final Fantasy series with each new release. From cries of betrayal when Final Fantasy 7 jumped ship to PlayStation to frustration over the story changes Final Fantasy 15 underwent during its tortuous 10-year development process, there’s simply no such thing as an easy birth when it comes to Square Enix’s biggest franchise. Final Fantasy 12, the 2006 PlayStation release whose overhauled high-definition remake The Zodiac Age launches July 11, may well have been the most tortuous release of all. Arriving years late and abandoning numerous established series traditions in favor of a radically overhauled play style, FF12 immediately inspired ardent enthusiasm and passionate hatred among the series’ faithful, with seemingly little room in between. Worse, its troubled history and belated arrival led to a cascade effect throughout subsequent Final Fantasy titles. Because it shipped so far behind schedule and appeared at the tail end of PS2’s life, Final Fantasy 13‘s creators had to abandon plans to bring that game to PS2 and instead target next-generation HD hardware — a disruption with an impact on the franchise the company is only now beginning to get under control. It wasn’t supposed to be like that. FF12 was meant to be the safe game, the comfortable fan-fodder. Like with the charming Final Fantasy 9, the idea behind FF12 was to double down on series traditions and easy wins. Its creative team brought together Yasumi Matsuno, the visionary writer and director responsible for Final Fantasy Tactics, and Hiroyuki Ito, the systems designer who created the series’ two defining play mechanics: The Active-Time Battle system and the flexible Job class system. 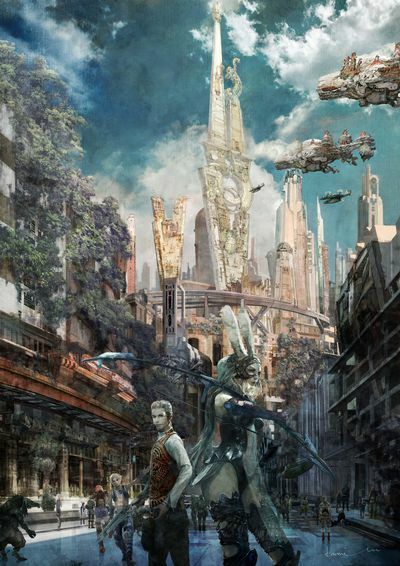 FF12 would combine the best and most beloved elements of the franchise in a setting steeped in Final Fantasy’s established rendition of Western high fantasy: Kingdoms and royalty, knights and airships, pirates and nihilistic gods. While Yoshinori Kitase’s team explored sci-fi futurescapes with Final Fantasy 10 and 13and Hiromichi Tanaka led the charge into massively multiplayer online collaboration with Final Fantasy 11, Matsuno and Ito’s names hinted at a game that would embrace fans who felt increasingly disenfranchised by the series’ movement into new settings and genres. Of course, Matsuno and Ito didn’t create the game single-handedly. Their collaborators on Final Fantasy 12 included such luminaries as illustrator Akihiko Yoshida, composer Hitoshi Sakimoto and designer Hiroshi Minagawa — all of whom had been largely inseparable from Matsuno since working together at Quest on groundbreaking tactical RPGs Ogre Battle and Tactics Ogre. They’d all moved over to Square together to team up again on 1998’s Final Fantasy Tactics and the stunning cinematic action RPG Vagrant Story, and Ito had contributed heavily to Tactics, refining the character class Job system he had designed for Final Fantasy 3and 5 to its next evolution. Square as a company, and Final Fantasy as a property, were collectively in a state of flux around the time FF12 was announced. In 2001, the company released the ambitious first (and, it would turn out, final) full-length motion picture of its Square Pictures movie imprint in the form of Final Fantasy: The Spirits Within. That film’s crushing failure at the box office in part led the “father of Final Fantasy,” series lead designer and producer Hironobu Sakaguchi, to depart from the company and establish his own studio, Mistwalker. Amidst this turmoil and the uncertainty surrounding the online-only Final Fantasy 11, fans could at least rest assured that the next numbered Final Fantasy would be a mature, grounded work created by some of the most talented people at Square. And so it would be — but the end result wasn’t necessarily what series fans had been dreaming of. Now, more than a decade later, two key personnel on FF12 hope series fans will give this polarizing entry a second chance. Takashi Katano and Hiroaki Kato make for something of an unlikely pair. Katano is every inch the classic vision of a game programmer: Round-faced, soft-spoken, with his fashion choices tending toward buttoned-up shirts a conservative hairstyle. Meanwhile, Kato sets off his lean features with an unruly mop of hair and trendy, thick-framed glasses, while a hint of wry amusement frequently tugs at his lips. Yet the two have worked together on Final Fantasy 12 for almost a decade, all added up. While neither saw their names bandied about as marquee talent on the PS2 release, they both played critical roles in the original project. 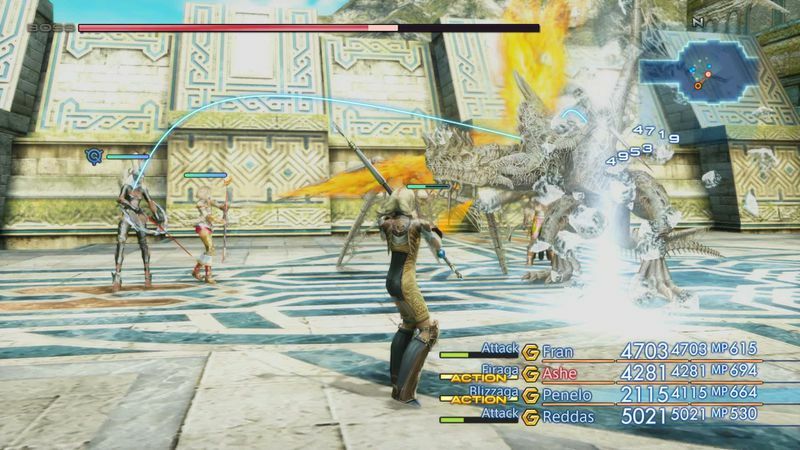 And with most of 12‘s project leads long since having departed from the company, Kato and Katano have taken charge of the game’s upcoming remake, The Zodiac Age. Having been entrenched in the FF12 project more or less from day one, Katano confirms that despite struggles that beset the team, the final product closely resembled the team’s original creative vision. It turns out that, despite assumptions by many players, the radical upheavals FF12 brought to the franchise formula were always a part of the plan. FF12 represented a fundamental shift in design from FF10. That game had largely pared down the concept of what a Final Fantasy game could be. While it brought considerable technical advances to the series, including fully voiced story sequences and an end to the pre-rendered static backgrounds of the PlayStation One Final Fantasies, it stripped away any pretense of freedom to explore. Even more shockingly, FF10 abandoned Ito’s trademark Active-Time Battle system — a hybrid of real-time and turn-based menu-driven command — in favor of a strictly turn-based format. Battle in FF10 called to mind the turn-order management of the company’s tactical RPGs. Perhaps not surprisingly, the system’s designer Toshiro Tsuchida had come to the project fresh from working on tactical RPGs like Arc the Lad and Square’s own Front Mission trilogy. Ito, with Katano’s help, hoped to push FF12 back in the other direction. Even the name the team came up with for its new battle system, Active Dimension Battle, suggested an evolution of the old Active-Time Battle. In many respects, ADB combat felt inspired by the inventive 3D combat system that had appeared in Vagrant Story, Matsuno’s previous project. 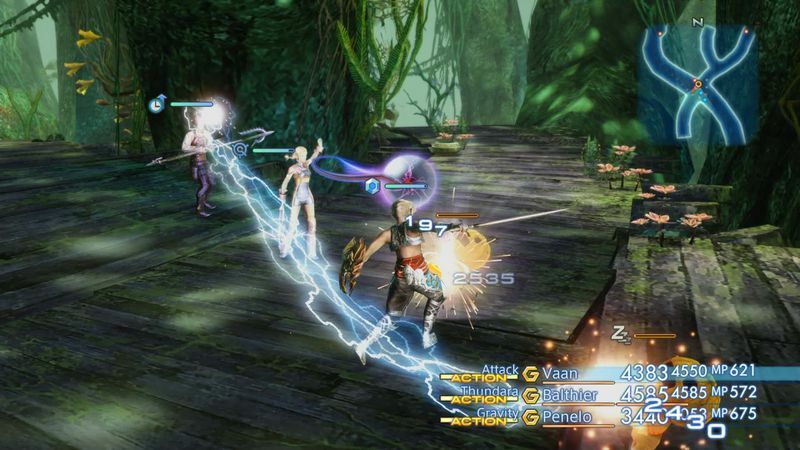 Where Vagrant Story focused largely on one-on-one combat, however, FF12 needed to work for a party of three or four characters against half a dozen or more enemies at once. 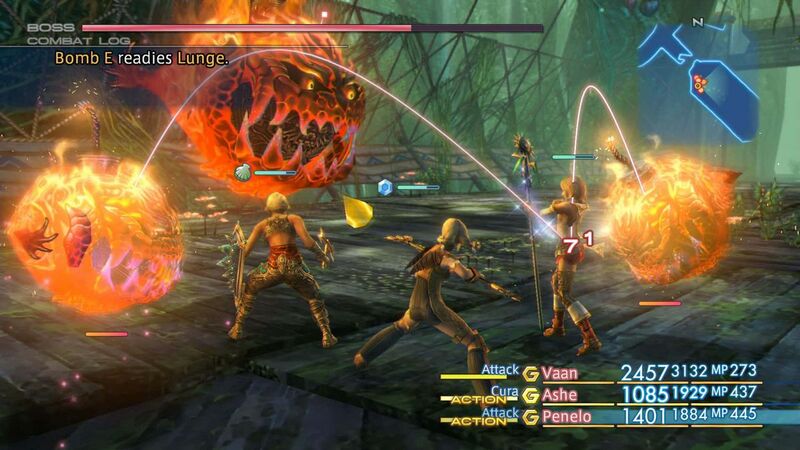 Even more ambitiously, FF12‘s battle system would break down the barriers between exploration and combat, allowing fights to unfold in the same virtual space as standard dungeon-crawling. Even more than the Active Dimension system’s ability to target foes and seamlessly initiate combat, the Gambit system sat at the heart of FF12‘s battle mechanics. It also proved to be, by far, the game’s most controversial inclusion. Some players felt it removed their agency of the action or trivialized the strategy of combat. Popular webcomic Penny Arcade lampooned the Gambit system by envisioning a self-playing version of Super Mario Bros. that allowed players to set Mario to jump and stomp Goombas without their input. In effect, Gambits allowed players to set the behavior of their party members in battle by rigging a simplified programming language. As players acquired additional Gambit rules, they could largely automate combat by setting conditions to guide their team’s actions. At the most basic level, you could set characters to automatically use fire-based spells against enemies weak to fire. But you could also connect more complex commands: For example, using the Oil skill to render an enemy vulnerable to fire, which could then be exploited by the character set to target elemental weaknesses with fire spells. Gambits could allow you to set your party to perform incredibly sophisticated sequences of commands, freeing you from the need to micromanage their every action — though you could still bring up the command menu to freeze time and adjust tactics on the fly as needed. Despite the complications involved in implementing the Gambit system, Katano says it felt like the most natural approach to solving the problem of making the Active Dimension system a reality. “We never really explored the idea of having the players issue individual commands,” he says. “It was never meant to be that way. As it happened, though, the Gambit and Active Dimension Battle systems weren’t entirely unprecedented within Final Fantasy canon. 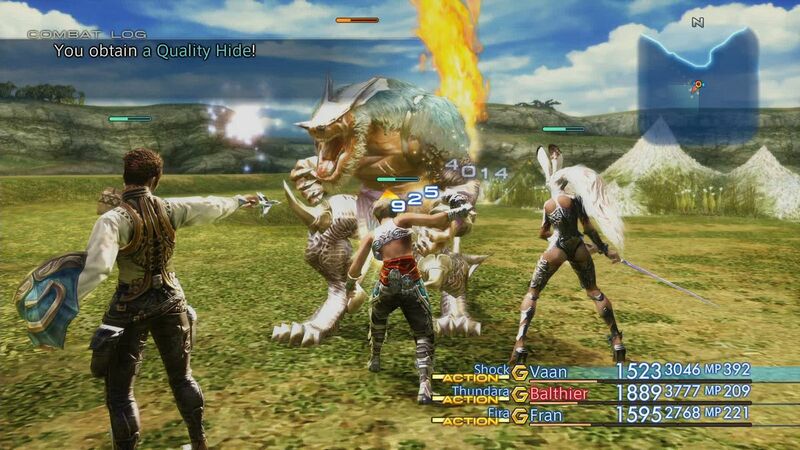 FF12‘s approach to battle felt almost like a single-player adaptation of the massively multiplayer approach to unified exploration and combat Hiromichi Tanaka’s team was designing for Final Fantasy 11. While this connection may not have been deliberate, as each team within the company worked more or less alone, Kato acknowledges that it wasn’t a complete coincidence, either. “There wasn’t specifically an intentional sharing of concepts with FF11,” he says. “But, at the time, a lot of the staff were playing FF11. Being part of the same company, I think it informed our ideas and influenced our decisions in some ways, with FF12 having some unique elements necessary to make that work for single player. But there wasn’t a conscious sort of exchange there. Ultimately, Katano says, the team’s goal for FF12 was to let players approach the adventure however they like. Unlike with FF10, the hand of the creators would provide gentle nudges rather than firm directions. Matsuno’s team simply aimed to facilitate player choices while minimizing the damage mischievous minds could inflict on the game. “I wouldn’t say there was any resistance to the open world design [at the company], because that was just such a basic principle of the project,” he says. “Everybody was in on it. It was more a question of, you know, how we were going to do it. It was accepted and there wasn’t resistance except that it was really going to be very difficult. So, ultimately, everyone was simply focused on how they were going to accomplish it. Unfortunately, these best of intentions encountered some critical stumbling blocks along the way. Final Fantasy 12 ended up shipping about two years later than its intended launch date. The impressive ambitions the team members laid out for the next evolution of Final Fantasy proved even more complicated than they had expected. Yet an even more critical roadblock emerged sometime around the game’s first major playable public showing at E3 2004: The departure of the game’s lead designer, Yasumi Matsuno. The precise nature of Matsuno’s resignation from the company and the game remains shrouded in speculation. Perhaps, as some people claim, he suffered a health crisis inflicted by the stress of carrying such a massive project on his shoulders. Or maybe there’s something to rumors that he left due to frustration over executive meddling in the game’s creative direction. Matsuno’s original vision for FF12‘s story centered around Basch fon Ronsenberg, a knight falsely accused of regicide, as the lead character. 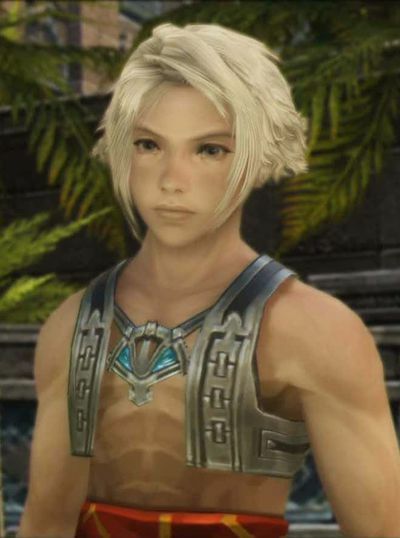 While Basch and his struggle to restore his good name remain a critical element of the final version of the game, the company’s higher-ups reportedly insisted that teenage duo Vaan and Penelo be made the game’s point-of-view characters. Final Fantasy has to connect with young players, and Basch (being an elderly 28 years of age) evidently wouldn’t do. Or perhaps Matsuno’s departure involved a little of both columns A and B. His projects leading up to FF12 had been smaller, more niche-oriented works: A compact dungeon dive, a chess-like tactical game. FF12 by its very nature as a numbered Final Fantasy sequel had to appeal to a far wider audience than a franchise spinoff. Meanwhile, the expansive open-world vision the FF12 team chose to pursue made for a venture as demanding as the most massive contemporary PC RPGs, such as Morrowind. Matsuno’s work leading up to FF12stood out amongst its peers due to its uncompromising sensibility. Yet a tentpole release for a corporation the size of Square Enix necessarily involves compromise on both ends. Following Matsuno’s departure, veteran RPG designer Akitoshi Kawazu stepped in to guide the project to completion. Kawazu’s work on unconventional role-playing experiences (Final Fantasy 2, SaGa, Legend of Mana) has given him a reputation for creating difficult, unfriendly games — a reputation he happily embraces. As a result, many fans attribute the uneven quality of FF12‘s final act to Kawazu. Katano also emphasizes that some of the game’s more polarizing or controversial features were in place long before Matsuno left the team. “The part about the change in lead character — that change actually was pretty early on in development. Really, in terms of the story tied into development, there were some slight changes as to which character would appear at which stage, but nothing that would overwhelm development, necessarily, in terms of changes to the plot. For Katano, the idea that the team was beholden to some external vision because of its name is ultimately counterproductive. “This is strictly my own opinion,” he says, “but the question of, ‘Is what we’re making Final Fantasy?’ never really occurred to me, because Final Fantasy is what you make of it. It’s not predefined. “That’s honestly pretty much the gist of it: ‘Final Fantasy’ is what comes of the process of giving it your all. If I were concerned about one thing, it was simply making sure players would find the fun and understand the play style we were going for. “At the time, you know, the Gambit system and the seamless world and all the side quests … having those all concentrated on a single disc, that was satisfying,” adds Kato. “All that volume — that was very impressive to me, especially for that hardware generation. More than a decade on, FF12‘s creators seem curious to see how players will react to the game’s HD remaster. In many ways, the elements that made the PS2 release so controversial in 2006 feel like a result of FF12 being a work ahead of its time. Today, seamless open world RPGs have become standard fare on consoles, to the point that games from completely unrelated genres frequently integrate concepts that felt so strange and unexpected in FF12. Likewise, the idea of highly automated, A.I.-driven RPG combat no longer seems like a betrayal of the genre. Both of Square Enix’s numbered, single-player sequels to FF12 have incorporated combat mechanics similar to that of the Active Dimension Battle system — minus the Gambits — while blockbuster franchises have helped standardize FF12‘s approach to A.I. party companions in everything from shooters to stealth games to Western RPGs. You can see FF12‘s DNA in everything from The Witcher 3 to Metal Gear Solid 5. If anything, The Zodiac Age runs the risk of feeling too commonplace in 2017. Considering how jarringly unconventional FF12 felt a decade ago, that may be the game’s greatest claim to fame. However, Katano rejects the idea that the FF12 set out to revolutionize the RPG. “We weren’t really trying to change the world, or change the game industry, with what we were doing,” he says. “We were just exploring something that we thought was fun. So in that sense, it’s a success. The game’s legacy is that success, in that people enjoy it. “I feel pretty much the same,” says Kato. “It wasn’t about changing the world or the game industry. It was just about making something that people would enjoy. And seeing that at the time, you know, Japanese RPGs had all been pretty much command-based, it was something very new for that era, so for the time … having that seamless open world … yeah. Looking back, it was a pretty bold challenge, come to think of it. So I think that’s part of the legacy.